This enormous series from Salem Press is vital for any academic library that wants its patrons and staff to take a serious approach to comics. Editors Bart Beaty and Stephen Weiner split Critical Survey of Graphic Novels into "Manga" (one volume), "Heroes and Superheroes" (two volumes), and "Independents & Underground Classics" (three volumes). 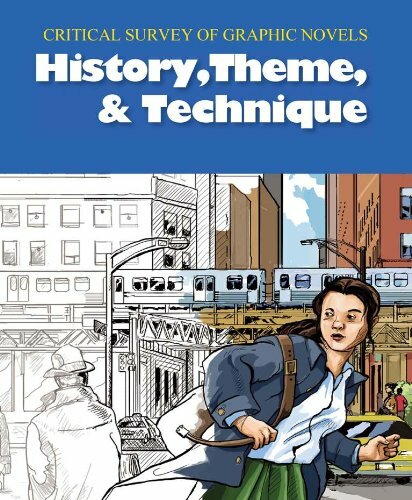 A fourth entry, "History, Theme, and Technique" (one volume), expertly covers an impressive range of topics, from the significance of specific historical periods; to the roles of gender, distribution modes, and public perception in understanding the form; to genre and thematic conventions, and much more. An additional section on the publication process provides a helpful view perspective on works that can often feel like they were born fully formed, and appendices providing a glossary, a bibliography, a historical timeline, and a rundown of major comics awards and their winners make this already practical resource even more useful. The other six volumes survey the literature itself, with more than 400 series and standalone books covered among their pages. Each entry includes title's publication history, plot, character, artistic style, themes, and "impact" (notes about reception, awards, controversy, etc. ), plus occasionally bios about the authors and notes about adaptation into other media, all of which are impressively thorough. Finally, reviewers ends with suggestions for further reading (similar titles to the one covered), a bibliography (other coverage of the title or its creators in books or periodicals), and "see also" (similar titles covered within the Critical Survey), instantly providing relevance for reader's advisory, collection development, and scholarly research. The depth and breadth of this series is truly remarkable, making it absolutely worth the steep price for a library to purchase. (And with new editions coming out, it's likely that more affordable used copies of the first edition will occasionally appear on the market as well!) It's clear that each contributor is dedicated to the task at hand, and while some bias and contradictory information is inevitable with so many contributors, I was pleased that none wrote with self-deprecation or a "bang pow zap, comics aren't for kids anymore" approach to their selected topics. I was especially impressed by the "artistic style" sections, since, counterintuitively, reference works like this often treat comics' visuals as an afterthought. And while I was sometimes left cold by the "History, Theme, and Technique" volume -- I wanted them to spend longer with each topic -- I'm certain that's mostly a case of my (unfairly) wishing for a different kind of resource. As mentioned above, academic libraries are the ideal audience for this series because it is such a thorough, serious resource for both librarians and researchers, and archives may find the "History" volume useful for providing context to their comics-related work as well. Public libraries with suitable budgets, large comics collections, and robust readers advisory programs will benefit as well, since the series covers so many titles so thoroughly. The publisher suggests that high school libraries are another suitable home for the series, and while this is probably true, it's hard for me to imagine a school library with the budget for it. Special thanks to Critial Survey of Graphic Novels contributor Lisa Schimmer for introducing me to the series, and for the use of her copies! I've got some readin' to do. I'm an Adult Services Librarian in Durham, North Carolina, where I'm a co-organizer of the annual Durham Comics Fest and the writer of a monthly e-newsletter of new and notable comics and graphic novels in the library.